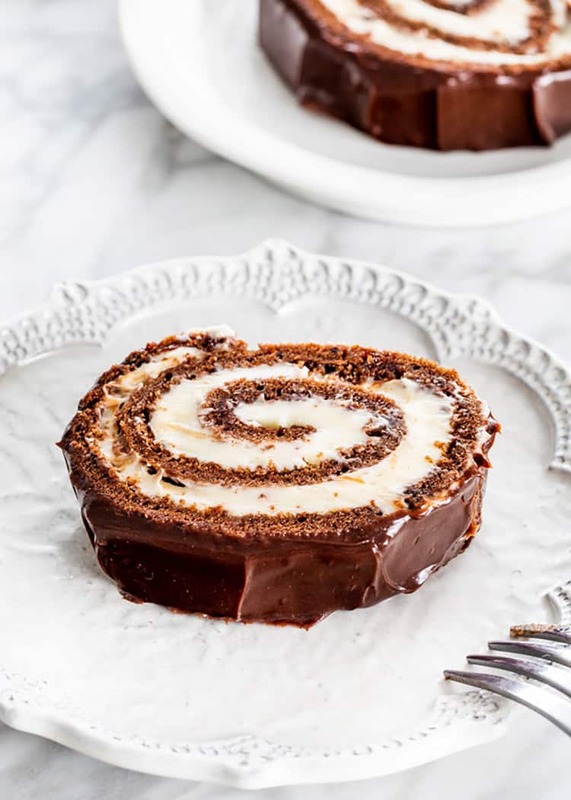 This decadent Chocolate Swiss Roll Cake is wrapped around a rich cream cheese icing, and covered in a silky chocolate ganache. You won’t be able to help yourself from going back for seconds, or even thirds! 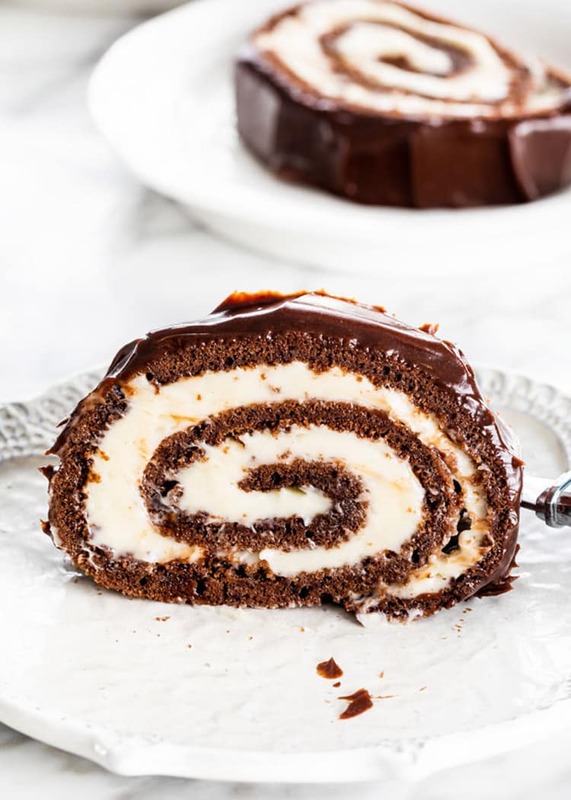 This cake looks so gorgeous coated in ganache, with a swirl of icing in the middle, plus it’s not hard to make at all! 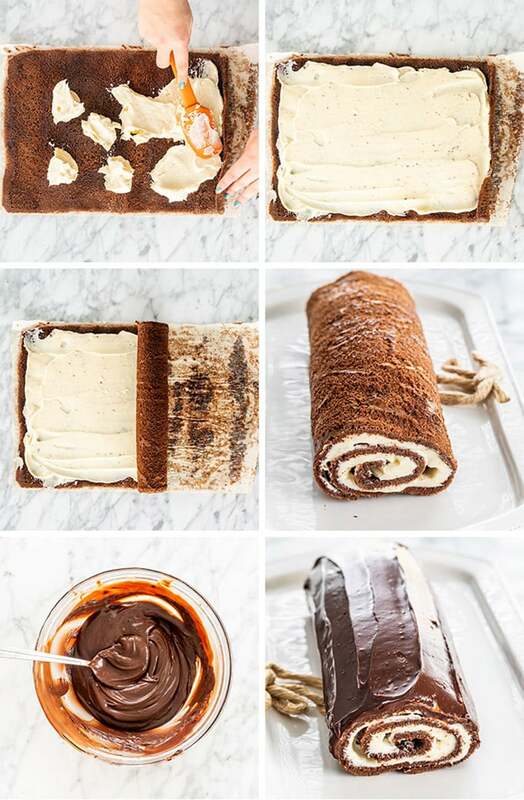 There are so many ways that you can make this chocolate roll cake your own. This is one of those recipes that you can dress up or down depending on what you like! 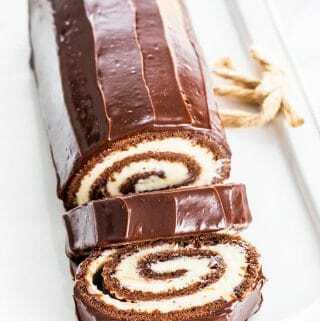 I stuck to a classic Swiss roll style with a beautiful contrast between the white icing and chocolate cake. I kept it simple with this version to show you guys the basics of making an incredible roll cake, but you can add slices of strawberries or raspberries inside the cake, or lined up on top of the ganache. The sky is the limit! You can even flavor the icing however you like. Roll cakes have been gaining popularity lately, and for a good reason. They are stunning, delicious, and deceivingly easy to put together! They’re also perfect for serving a small group, and much easier to store leftovers versus their larger counterparts. Make the cake batter: This batter is very basic, and it is thin. This is to ensure that it fills your 10×15 inch pan perfectly with no lumps or bumps. Using coffee in this cake won’t give it a coffee flavor, rather it will bring out and accentuate the flavor of the chocolate. You can use 1/2 tsp espresso powder instead of the coffee if you have it handy. Leave the coffee out completely if you wish. This batter can be made using a stand mixer, a hand mixer, or even a whisk. You just want to make sure it comes out smooth. Transfer to a baking sheet: Grease your 10×15 inch baking sheet and then line it with parchment paper cut to fit the pan. I find it helps leaving a 1/2 inch of parchment paper hanging over one of the 10″ edges. This makes it easier to pull the cake off the pan once it’s ready. Spread the batter over the baking sheet using a spatula and tap it a few times on the counter to make sure it’s even. Bake the cake: With your oven set to 350F, bake the cake for 10-12 minutes. Since the cake is so thin, keep an eye on it so it doesn’t burn. Remove from the pan and roll the cake: Run a knife along the edges of the cake to loosen any tough pieces sticking to the pan. Grab your overhanging piece of parchment paper and carefully pull the cake out of the pan. Roll the cake as soon as you can handle touching it – this is the best way to get a crack-free cake. If it does crack a bit, don’t worry. Between the icing and the ganache it will be hard to notice imperfections. Allow the cake to cool completely. Make the icing and ganache: While the cake is cooling, you can make your cream cheese icing. If you don’t prefer this type of icing, you can always use buttercream or royal icing. You may set the icing aside in the fridge to cool if you want it to be more firm for assembly. Prepare the ganache right before assembling the cake for easier spreading. Assemble the cake: Make sure your cake has cooled completely before assembling the components or else the icing and ganache will melt. Unroll the cake, and spread the icing leaving 1/2″ free around the edges. Roll the cake back up tightly, and remove the parchment paper as you roll the cake. The parchment paper should come off very easily. Pour the ganache over the cake and spread using an icing spatula or a butter knife. Allow the cake to cool in the fridge. Cut slices with a serrated knife and enjoy! 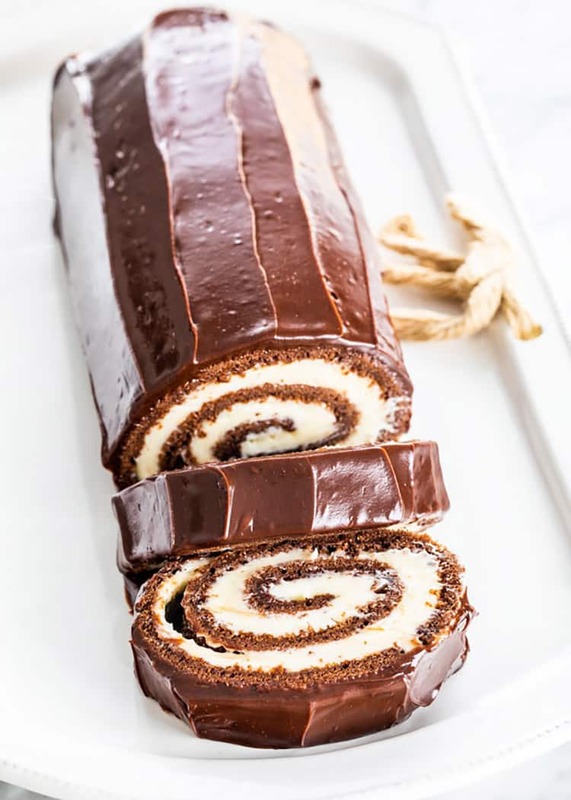 This decadent Chocolate Swiss Roll Cake is wrapped around a rich cream cheese icing, and covered in a silky chocolate ganache. You won't be able to help yourself from going back for seconds, or even thirds! Preheat your oven to 350 F degrees. Spray a 10x15 inch baking sheet with cooking spray and then line it with parchment paper. This will ensure the parchment paper will stick to the pan. Set aside. In a medium size bowl, whisk together the flour, cocoa powder, baking powder, and salt. In another medium size bowl whisk the eggs, sugar, butter, vanilla, and coffee until there are no lumps. Pour the wet ingredients into the bowl with the flour mixture and stir using a spatula. If lumpy switch to a whisk and whisk until smooth. Spread the cake batter evenly into the prepared pan using a spatula. Gently tap the pan a few times on the counter, this will remove any air bubbles. Bake for 10 to 12 minutes or until the top of the cake springs back when touched. 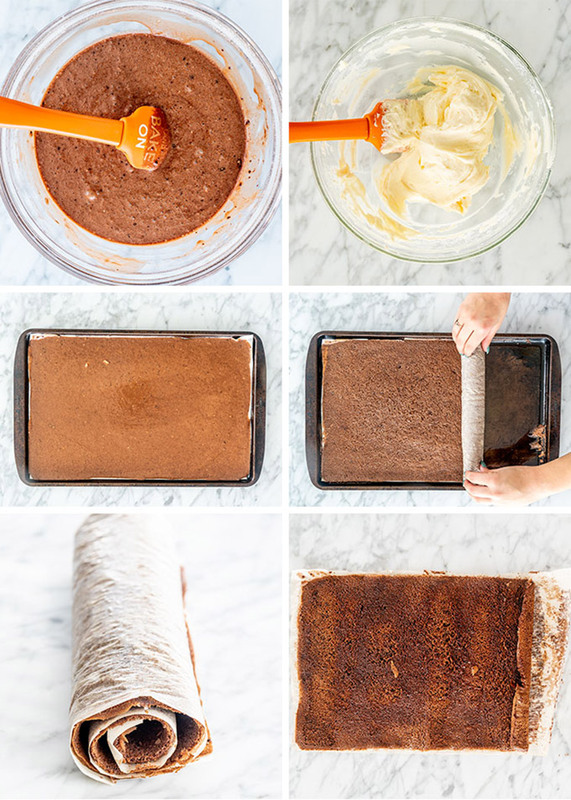 While the cake is still hot, carefully lift the cake with the parchment paper out of the baking sheet and slowly roll the cake using your hands, rolling from the short end to the other short end. Let the cake cool completely. In a medium size bowl whisk the cream cheese with the butter first. Add the vanilla and icing sugar and whisk or beat using a mixer until smooth. In a bowl, add both the chocolate chips and heavy cream. Microwave in 30 second intervals until the chocolate has melted. Whisk until smooth. Gently unroll the cake. Spread the filling evenly over the cake, leaving about a 1/2 inch border on all sides. This will prevent frosting from squeezing out. Tightly re-roll the cake, while gently peeling away the parchment paper as you roll. Tightly wrap the cake in plastic wrap and refrigerate for an hour. Remove the plastic wrap from the cake and transfer it to your serving platter. Pour the ganache over the entire cake and spread evenly. Slice the cake using a serrated knife and serve. Slice off about 1/2" from the ends to have a perfect swirl on each end. Store leftover cake in an airtight container in the fridge or tightly wrap it in plastic wrap and refrigerate. The cake should last about 5 days in the fridge, or up to 3 months in the freezer. Can this be done using a 9.25×13.25 inch pan? I think it’s too small, the cake itself might end up too thick so it won’t be so easy to roll.